Chopper Pictures Wanted (Stock Bikes Too)...Become Famous! WANTED: Subscriber chopper pictures (motorcycle pictures) so we can make you famous. (Post a picture and a short description now). We are put together a slide-show-movie for all of our subscribers -- You! And it's a big hit. And now we want to make Part II, III, and VI. We will put them up on the most popular video sites. Tens of thousands will see your bike. So get it in now (see below). Only subscribers are invited to participate so if you are not a subscriber, join now. It's time to show off your bike! All we ask is that you are not trying to sell a bike, or post a motorcycle picture from your showroom floor. This is just for the guys and gals who love their rides and want to show the world. If you want to post a picture of yourself along with your ride, that's fine. Be sure you put your full name and geographic location in the form below so we know what to put on the slideshow. Here is the current video project just in case you are wondering. Upload A Picture Of Your Bike And Describe It! Simply upload a picture of your bike and tell us the details. The more the better! We might put you in a slideshow movie that tens of thousands of people will see! Raked 30 degrees, stretched 8", 15" motocross shocks. I chopped this 1200x 1991 Sportser into a Marine Corps themed bike. Enjoying my 2002 Hardtail Sportster Bobber now that it is done! Or is it ever done? Planning some minor changes to it in the near future. 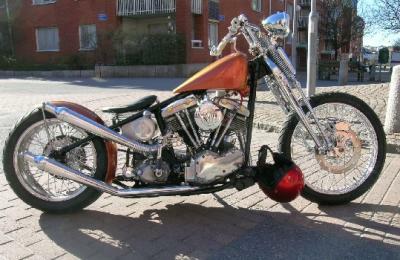 My Old School 1946 Knucklehead Chopper. It's a 1980 Yamaha XS 650 Parallel Twin Rat Bike. I built this fun to ride rat bike with only about a $ 500.00 Dollar investment. Bobber in New Custom Style! Home fabricated custom 100" RevTech custom chopper. My custom 1991 xl sportster. Not finished getting springer front end and paint yet. This is screwbean cb400t. Whe started life as an ugly cb400t(hawk). SHE is now about half way finished. Enjoy! My Yamaha XJ100J is chopped up. It has mostly stock parts and a trailer fender. I got this xs1100 and chopped it up and put it back together. What more can I say? I am building this as I ride, as it is my only transport (makes it hard to balance lol). My 1999 sporty chopper. 1250 big bore, 180 rear tire, and AREA51 paint. I made this custom chopper seat for a friend, working on my bike. It's still being built. I hope you like the seat. Ruben. My 1975 Shovelhead has a home made swing arm, Oil/Gas Tank, and bars. It also has a chopped Frame, TT 600 Wheels, 3" BDL Primary Drive etc. My 1979 shovelhead: homemade frame, hayabusa rear wheels front and back, 200 tires. This is a 1981 XS 400 hardtail bobber. We custom made the frame to fit my wife. Very low seat height and light weight! Tons of fun to ride. Here is a 1969 FLH barn find that I'm currently restoring. What do you think? I built this custom bike in my shed at home. It's still unfinished. With the help of friends this is what spare parts can do for you! Another homerolled '84-ish shovelhead, Indian Larry Style. It has 3-D flames and covered in roll-on bedliner! Boney & Frank, Jr.
My springer has taken me all thru the Great USA without a problem. It won an award for the Springer. This custom pro street has a Kraftech frame, Revtech 100ci motor, 6 speed trans, and a 300 rear. This biks is a 1967 Pannshovel Slabside in old school style. Low and proud. Built it last year complete with flaked frame and a de-rake. 100% Modified in my garage-streched, raked,lowered, Hand made tank, motormounts, wiring. Don't be scared-do it! This is my first bike. I never built a motorcycle before. I customized this Dyna Lowrider myself with handmade parts. SV1000 Custom Streetfighter "Tongan Stallion"
This is my first Harley I traded a custom 1996 Honda VLX600. It's almost done. This is a 2002 sportster, with a closer look at the custom paint job. See other listing titled Sportster Custom 1200. This cb 750 rigid rat rod chopper was built in 76 in Tucson Arizona. All original and still screaming down I10 today. Dropped, chopped, Vance & Hines exhaust, custom built forward controls, HD lights, custom fender, blacked out motor, blacked out wheels, custom seat. Just picked this 1992 VLX 3000 Miles. Very clean. I am making a bobber out of it. So far, front fender becomes rear, homemade pipes, w/4" baffles. This bike is listed on this sight as ( no buttons hard tail custom ). Here it is a few years later with a face lift. Still no buttons. Big Twin Kicker - Homemade rigid frame. Kickstart suicide shift. Big twin. My project bike: 1973 Harley XLH. I have to wire it up. It had many parts missing when I got it. This is the blueprints for my 300 series rigid which I got from BCC Orlando via custom-choppers-guide.com. It was my uncle's bike, a 1983 Wide Glide. I love it! 93 cubic inch, quad plug shovelhead. 1978 XS 1100 Yamaha, slightly modified in appearance only. My Deuce 2005 FXSTD with a HeadQuarters 103. She was my first project and she came out better than I had even hoped. This 1999 Kawasaki Vulcan 800 is raked 5 degrees, Vance and Hines exhaust, Corbin stinger seat, and everything is chrome on the front end. Honda 650 rebuild number one. I'm a member of TopHatters M/C Nomad out of Tucson Arizona, my bike has 30,000 miles on it and I am in the process of adding a sidecar to it. Just the frame swingarm rocker box covers And clutch cover are still harley! A 1993 cb 750 Nighthawk, 6 over 41mm front end, Hardtail SBF frame from the 70s, 42degree neck, 5 over in the trees, powder coat blue/black. This 2007 Harley Davidson Roadking is way beyond stock. I wish you could see the Chamilion. Redneck frame, 113 ultima mtr, T P Engineering 6 speed, Villan tank, Russ Wiermont fenders, 250 tire chain, built this custom chopper by my son and I.